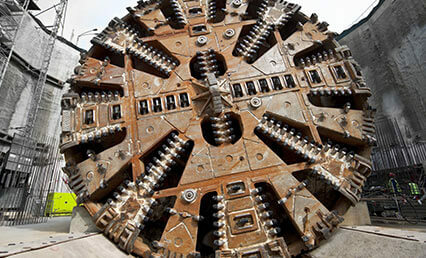 The cutter heads of tunnel boring machines face extreme levels of wear. This can often result in significant downtime periods for maintenance when traditional wear protection materials are utilised. Ensuring maximum uptime, FEROBIDE is the ideal solution as it enables boring machines to work for longer between maintenance revisions. FEROBIDE is unique in that it combines weldability with wear and impact resistance. 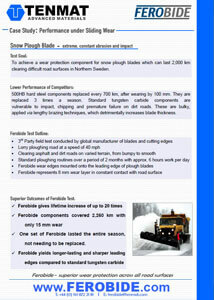 Third party field testing proves that FEROBIDE is the suitable material for protecting vital parts of the cutter head. The superior technical advantages of FEROBIDE have been proven through operation in some of the most arduous conditions, including the abrasive granite rock in the Hallandsåsen tunnel project. It was here that FEROBIDE continues to outperform standard hard-facing methods, whilst simultaneously reducing maintenance and the associated downtime costs. Typical applications for FEROBIDE are found on the face and the periphery of the cutter head, including cutter disc shields.